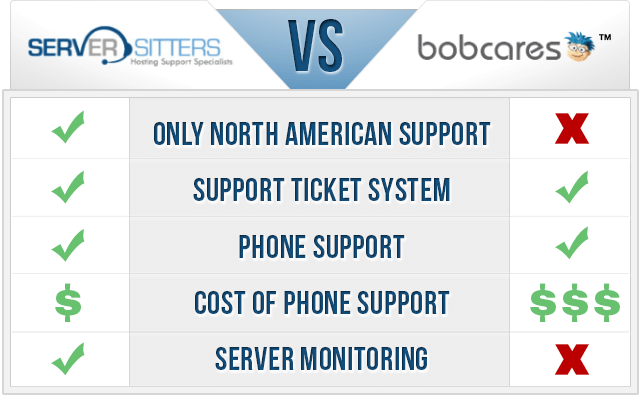 Bobcares vs ServerSitters – The Top Support Team Is…. The right team to provide support for your hosting company is necessary. Technical support may be the most important part of any hosting company, past the actual hosting. Both ServerSitters and Bobcares provide technical support for hosting companies. A complete look at both of these companies will reveal which one is the right choice for your specific needs. Let’s start with the things they have in common. All four of these types of support are very important to any hosting company. The ability to outsource your support to experts provides something your customers desperately need. Past the support options offered by these two companies, they don’t have much else in common, except they were both started in 2001. One of the glaring differences when looking at Bobcares vs ServerSitters is where the support comes from. All of the hosting support provided by ServerSitters is North American support, whereas Bobcares provides mainly support from India. This makes a difference when it comes to the end user and most prefer North American support over support from India. Bobcares may provide a lower price for ticket and chat support, but they quality isn’t the same as ServerSitters. Since ServerSitters uses only North American support, the quality is much higher. Both companies provide phone support, but Bobcares charges nearly three times as much as ServerSitters for US based phone support. This makes a big difference because the quality is the same, but the price separates the companies when it comes to this area of support. ServerSitters also offers server monitoring instead of just server management. Bobcares doesn’t offer server monitoring, which is vital to any hosting company. This means, if a hosting company uses Bobcares, they have to provide their own 24/7 server monitoring, which can be very expensive. Comparing Bobcares to ServerSitters reveals a massive difference in where the support comes from. Bobcares is based in India and doesn’t provide dedicated English speaking account managers. 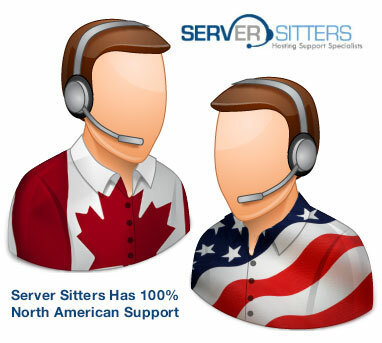 ServerSitters is based in the United States and Canada and provides dedicated English speaking account managers. This is a huge difference, which cannot be overlooked. With ServerSitters, you gain the quality your customers desire. Support makes a big difference and gives hosting companies a competitive advantage. However, if it’s hard to understand the person providing the support or it’s lower in quality, a hosting company loses its edge. It’s not about you, but about your customers. They will be the ones contacting the support team and they deserve a team of experts ready to provide 24/7 technical support. Of course, there is the issue of server monitoring and management. When you choose ServerSitters, you don’t have to worry about finding server monitoring elsewhere. With the server monitoring option, you gain minimum downtime because the ServerSitters team will keep a close eye on your servers. With server monitoring, not only does your company benefits, but your customers also benefit from less downtime. Bobcares doesn’t provide this service, which means you could be dealing with a downtime issue. This could drag your hosting company down and cause customers to shut down their accounts. Who Wins Between Bobcares vs ServerSitters? The winner of this battle is very clear. ServerSitters offers services you cannot get with Bobcares and offers full North American support. Bobcares uses mainly support from India and may offer a lower price for some options, but the quality isn’t as good. When you choose ServerSitters, you gain access to a professional support team based in North American, along with a dedicated English speaking account manager. Bobcares cannot provide you with this type of support, which makes ServerSitters the clear winner between Bobcares vs ServerSitters. If you want the best support for your customers, you need to choose ServerSitters for your hosting support. Your customers will be happy you chose the top support team in the industry. Not only will you be able to save money compared to hiring your own support team, but you will also gain the experience of top industry experts. Contact ServerSitters today for more information about the different services provided.